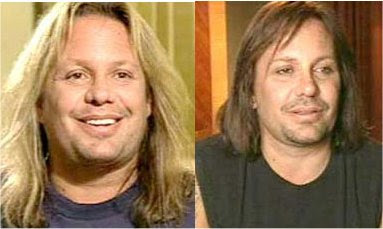 Vince Neil before and after plastic surgery. As you may remember, Vince Neil is the lead singer of that legendary rock band, Mötley Crüe. Countless years of partying and living life on the road can obviously take its toll on the body, both mentally and physically. And its certainly that kind of lifestyle that aged rocker Vince Neil, so prematurely. A few years ago, Vince thought it was time to try and restore his once good looks, and instead of investing his time and money into health and fitness, he choose slice and dice. That's right kids, Vince Neil choose plastic surgery, and a very public facelift it was, airing portions of it on his short lived reality show titled "The Remaking of Vince Neil". If you ask me, the guy just needed to lose a few pounds and change his diet, that alone could have knocked 7 years off his face. I love the way his little button nose looks now. Another celebrity with a botched nose job, yikes! Looks like he had the Gene Simmons plastic surgery, and that's a bad thing..
Not the same Vince that I fantasied over in the 80's. Ewww his nose & chubby face are gross & he just needs to cut that stringy hair.